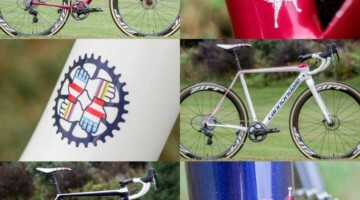 It wasn’t so long ago that you could get a Cannondale cyclocross bike in any material you wanted, as long as it was aluminum. 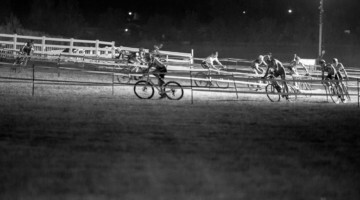 But in 2011, the carbon fiber SuperX debuted and pushed the National-Championship-Winning CAAD9 CX into retirement. 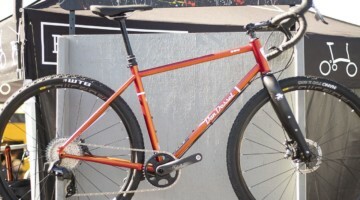 Since then, the aluminum CAADX emerged as the second-tier frame in Cannonale’s cyclocross lineup. 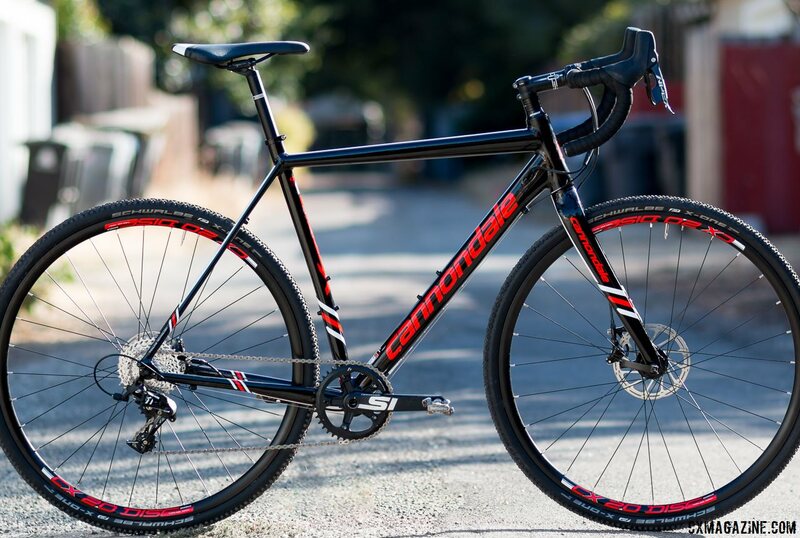 The geometry was different than either the SuperX or the outgoing CAAD9 CX, and it was positioned as a dual-purpose bike rather than an all-out racer. But that positioning has changed. 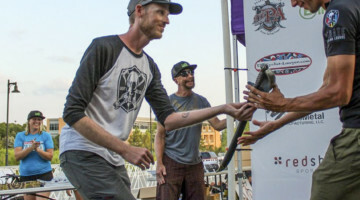 In 2013, the CAADX gained disc brakes and geometry closer to the disc brake-equipped SuperX that Tim Johnson helped develop, a welcome change for the budget-minded racer. And now, the CAADX has received a redesigned frame to match the new SuperX’s geometry changes. 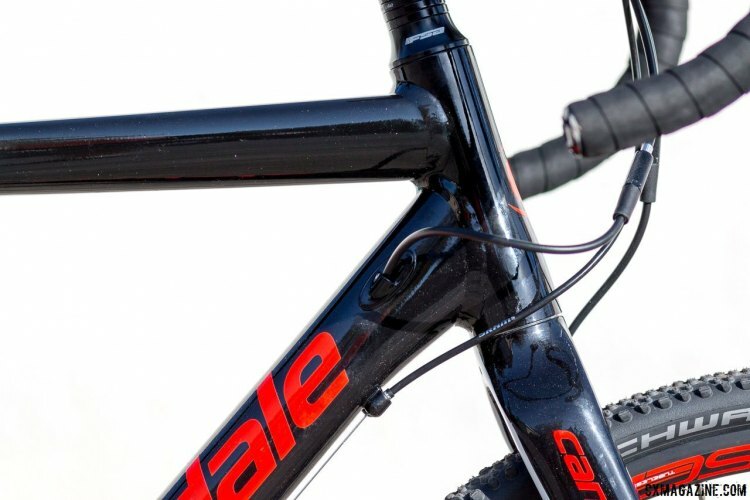 The CAADX has been completely redesigned, but several features of the frame are carried over from previous Cannondale aluminum bikes. These include the smooth welds, BB30 bottom bracket, and shift cables routed along the downtube. In fact, compared to the radically-different looking SuperX, one could be mistaken for thinking that not much has changed in the frame. But that’s not the case. The geometry is all-new for 2017, and matches the SuperX’s geometry chart to a millimeter (standover heights excepted). This also means that the frame sizing has been normalized so that our 56cm test bike sizes out to what we’d expect a 56cm bike to be. 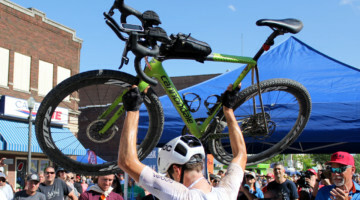 Previous models of Cannondale ’cross bikes were always labeled such that riders typically fit one size smaller than their road bike size. The new geometry also means the stack and reach measurements now scale more consistently from one size to the next. The CAADX inherits the SuperX’s “OutFront steering” geometry, which combines a slacker 71-degree head tube angle (on all sizes except the 46cm) with an increased fork rake of 5.5cm to push the front wheel further out and increase handling stability. 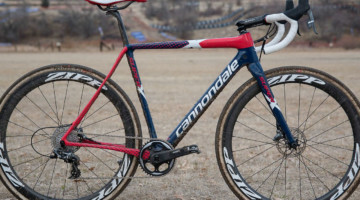 Cannondale has paired the increase in front center with nearly 1cm-shorter chainstays (42.2cm) and lowered the bottom bracket further (a 6.9cm drop on our tester) to embody what they feel is the optimal “North American” cyclocross geometry. 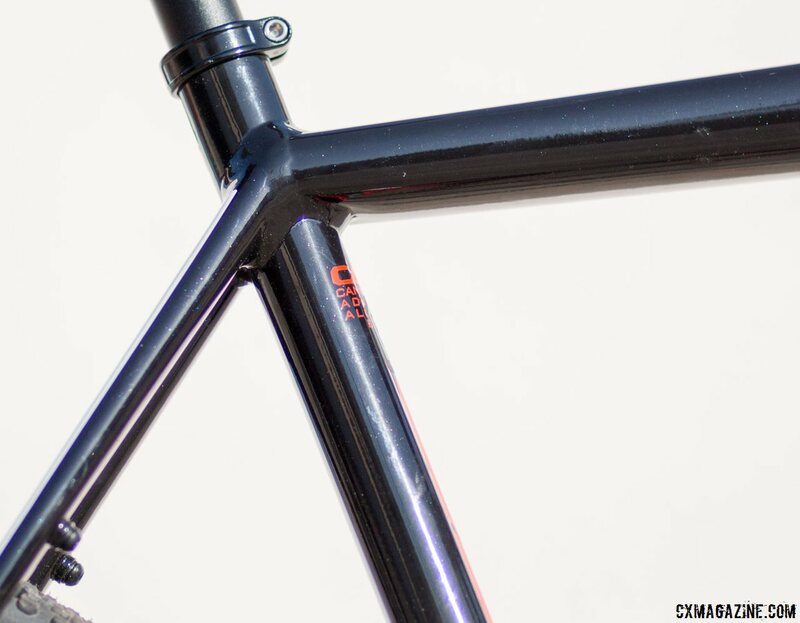 The CAADX’s frame details are a mix of new and old. As with the previous iteration of this bike, the CAADX’s shift cables are routed externally, beneath the downtube and underneath the bottom bracket. But now, brake lines are routed through the downtube and fork blade, and thankfully did not exhibit the rattling that we noticed on our SuperX test bike. The rear brake uses the flat mount standard, while the fork features a post-mount. The straight-bladed fork is all-new, and features internal routing for the brake hose as well as unobtrusive fender bolt bosses hiding on the inside of the fork blades. 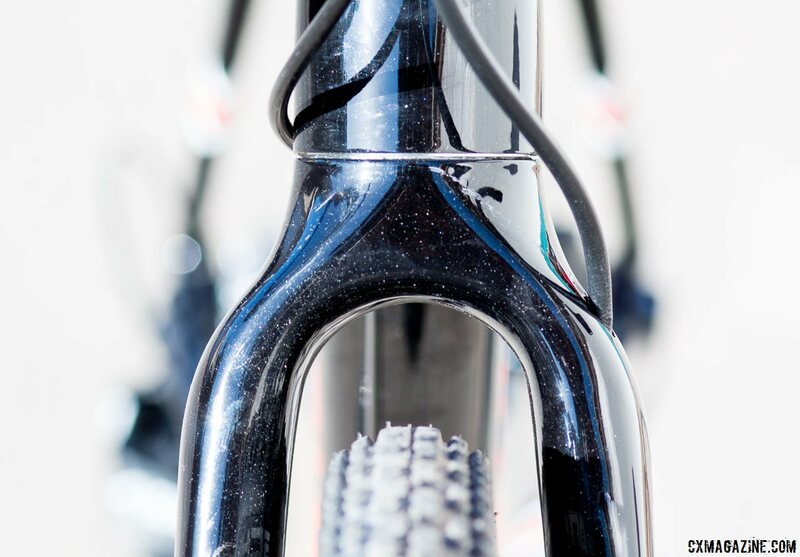 The alloy steerer tapers from 1⅛ to 1¼ inches at the bottom, with a resulting gentle taper to the headtube. Rear fender mounts are in the normal location on the dropout, along with a removable bridge that attaches between the seatstays. With the fender bridge removed, there is no bridge between either the seatstays or the chainstays. 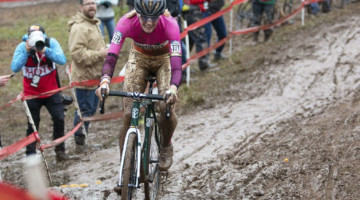 This improves mud clearance, although Cannondale only rates the CAADX for typical 35mm rubber. 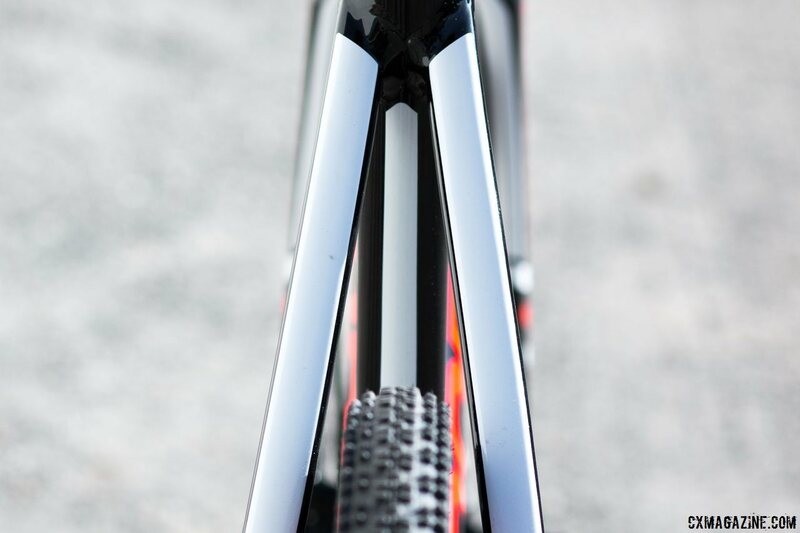 That’s one area where the CAADX differs functionally from the SuperX, which comes rated for 40mm tires. 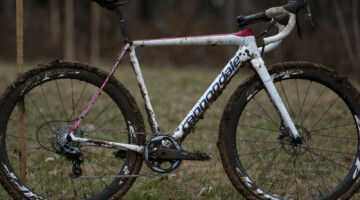 Still, the lack of a chainstay bridge means the mud clearance is better than previous Cannondale CX bikes. 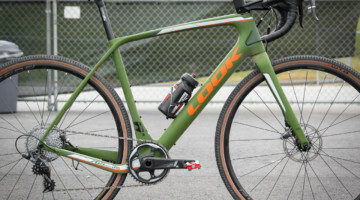 It puts this bike in an interesting spot in that tire clearance wise, it really only fits cyclocross tires or narrower out back, not today’s 40mm gravel tires, cementing its position as a cyclocross race bike, not a do-it-all machine. 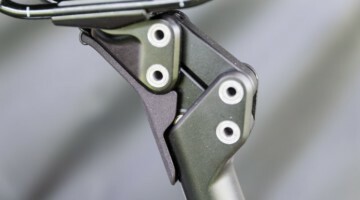 Speaking of those stays, the CAADX’s rear triangle features all the tricks that Cannondale deploys on their modern bikes to improve compliance–the seatstays are thin and flat, and the chainstays flatten out towards the dropout. Acronyms aside, the CAADX is designed to improve traction and rider comfort compared to the super-stiff wishbone rear end of the old CAAD9 CX frame and the typical lower-end aluminum CX bike. One thing that hasn’t changed from the CAAD9 days is the axle type: Quick-release axles are used front and rear, a surprising choice in 2017, although a possible necessity for the CAADX to match the SuperX’s super-short 422mm chainstays without resorting to a proprietary wheel dishing. Our test CAADX is the range-topping Apex 1 model, which costs $2060. 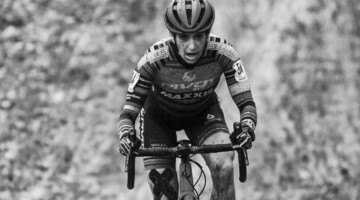 Apex 1 is the newest addition to SRAM’s 1x road/cyclocross group sets and brings the features and ergonomics of Force 1 to a more accessible price point. With a nigh-identical lever shape, shifting feel, and braking response to the higher-priced SRAM 1x groups, the Apex 1 equipment was almost imperceptibly different. The SRAM Type 2.1 (clutch-type) rear derailleur combined with a SRAM wide/narrow chainring on a Cannondale SI crankset up front deliver a quiet and composed chain over bumpy terrain as well as trouble-free shifting performance. Over time, the externally-routed shift cable did suffer some extra friction and shifting hesitation due to the dirt accumulating in the guide beneath the bottom bracket and in the final loop of housing before the rear derailleur. I’d prefer to see a full-length housing run, or perhaps a sealed cable set to mitigate this. In the rear, the 11-speed cassette provides a gear range of 11-32 teeth. 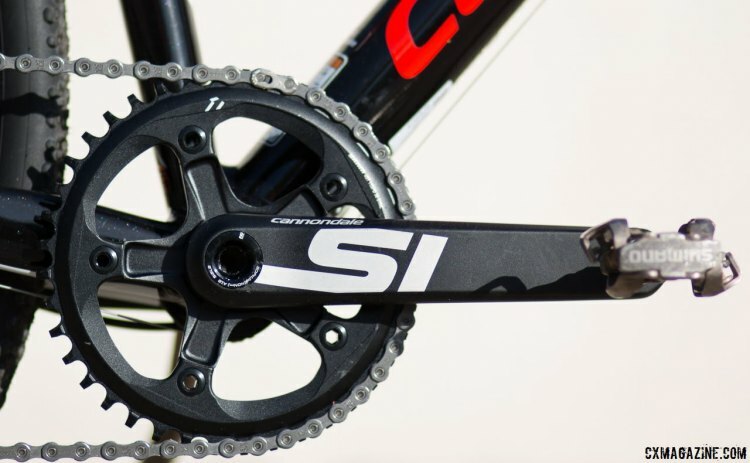 Paired with the 40-tooth chainring, this combination worked well for all-around riding and racing. But, perhaps speaking for myself here, an even lower gear wouldn’t hurt. I wouldn’t mind seeing a 36 tooth cassette specified on this bike. 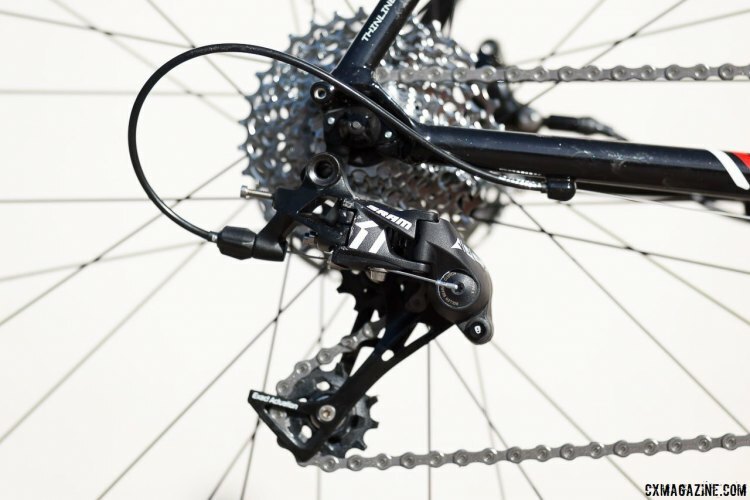 That said, the included long-cage Apex 1 derailleur is rated for a maximum cog size of 42 teeth, opening the option to swap in a bigger cassette for the hilliest of courses or all-year trail riding. Conveniently enough, SRAM has introduced a PG-1030 11-42t cassette to go with the Apex 1 group which would do the trick for $79. Braking feels the same as our other SRAM hydraulic brake-equipped bikes, which is generally a good thing. 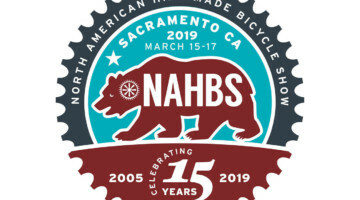 It doesn’t have quite the immediacy of Shimano’s hydraulic brakes, nor the mushiness that can characterize mechanical brake systems, but it worked very well in our testing. Furthermore, the high-hood shape of the SRAM Hydro-R brake hoods will feel immediately familiar to users of Force 1 or Rival 1. They may look a little strange, but the extra height really does help give a secure feel when riding on the hoods in the rough. Rotors are 160mm front, 140mm rear, clamped by a post-mount caliper in front and a flat-mount caliper in back. The CAADX rolls on a Formula/Maddux CX 2.0 wheelset, a heavy OEM choice typical of stock equipment on mid-range bikes. 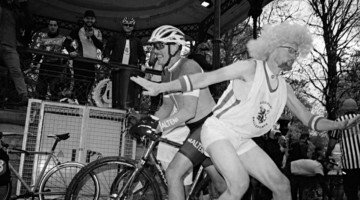 Although they get the job done, they don’t make the CAADX feel particularly sprightly off the line. 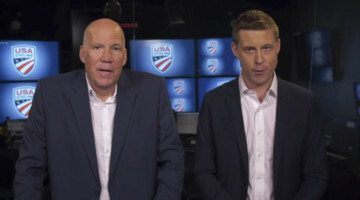 As usual, this would be the first part we’d upgrade. It’s not all bad, though. The wheels come pre-taped and the bike includes tubeless valve-stems. The 33mm Schwalbe X-One tires set up tubeless easily with a floor pump, holding initial inflation without sealant and forming a fairly reliable setup at 25-30psi once sealant was added. The Schwalbe X-One tires are nicely supple and the tread pattern is good for the intermediate conditions of Northern California’s ‘cross season. Unfortunately, the thin casing that gives these tires a nice ride became a liability in trail riding, suffering multiple cuts that refused to seal with Stan’s NoTubes sealant. And, at 33mm, they feel undersized compared to the larger tires that many of us amateurs run year-round on our bikes these days. 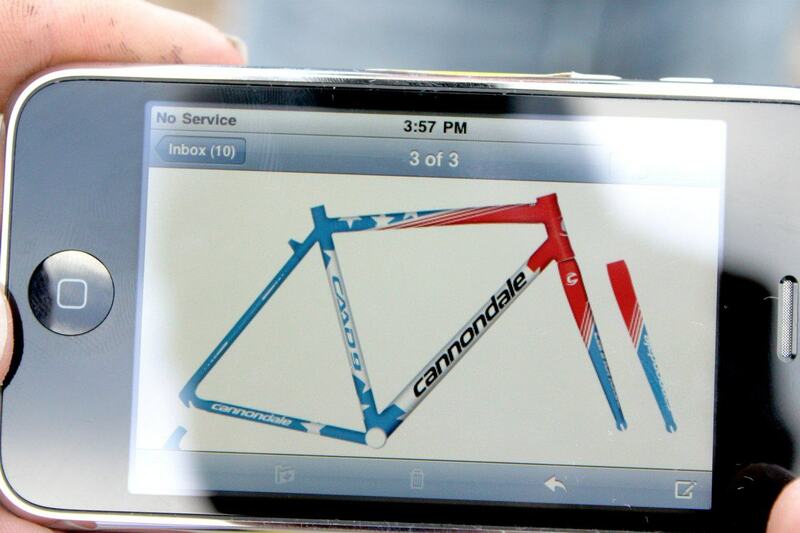 Cannondale finishes the build with a house-branded cockpit. The C3 alloy seatpost is secured by a normal clamp, a welcome feature after wrestling with the somewhat-fiddly hidden-bolt binder and carbon post on the SuperX. As usual, CXM applauds the use of a two-bolt design (or rather, bolt and thumbscrew) that keeps the saddle angle locked no matter how heavily we landed on the saddle during remounts. In fact, the combination of the seatpost head, material, and clamp makes for a worry-free setup out of the box. 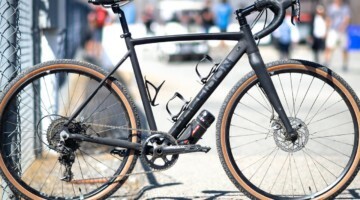 The CAADX is also available in two lower-priced builds with Shimano shifters and derailleurs paired with mechanical disc brakes. For $1350 you get a Tiagra drivetrain with Formula wheels and Promax brakes. 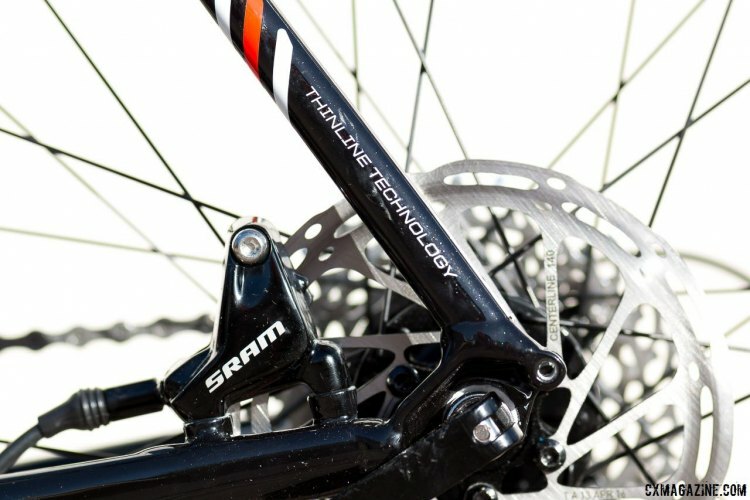 Stepping up to the next build for $1570 gets you Shimano 105 drivetrain and TRP Spyre brakes, along with the same wheels as our Apex 1 test bike, and twice the gears as our test bike. Both Shimano builds include a FSA crankset, and all three models share the same frame, fork, and cockpit parts. All together, our test bike was a hair under 20 pounds, for just over two grand. 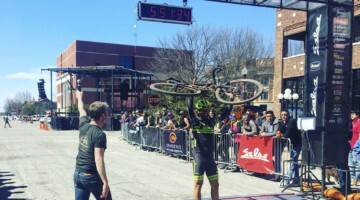 That’s not bad, and with some race wheels, an 18-pound bike is doable. The CAADX promises a SuperX ride on a budget. Can it deliver? 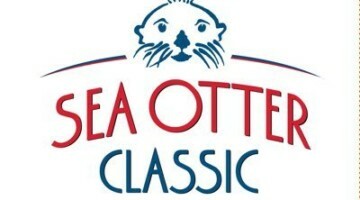 Based on initial impressions, it’s very close. Despite the change in frame material, the CAADX displays the same combination of high-speed stability and low-speed maneuverability that I enjoyed on the SuperX. And assuming you’ve got your tires and tire pressure dialed in appropriately low, the ride quality isn’t a world apart either. Standing up and hammering on the CAADX on dry and bumpy terrain was a pleasant surprise. Traction was good, reminding me again of the SuperX. The relatively generous stack height and low bottom bracket fit with my personal preferences in cyclocross geometry as well, so hopping on the CAADX makes me feel right at home.The old bikes were stiff and responsive, but tended to skitter across terrain that the CAADX cruises on. Acceleration was decent, at least given the heavy OEM wheels. 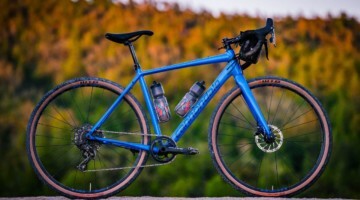 Stay tuned for our full long-term review on the Cannondale CAADX and SRAM Apex 1 in our print magazine, and see our other cyclocross and gravel bike profiles and reviews here. No doubt it is a nice bike. However, doesn’t $2,000 seem awfully expensive for a production bike with SRAM Apex?! 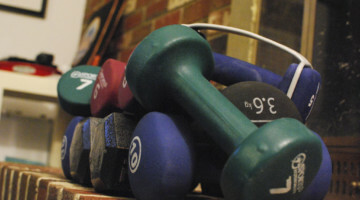 Check out the post – pictures and words describe it! My old 1987 SR500, this bike will still out performs all my new carbon bikes today. 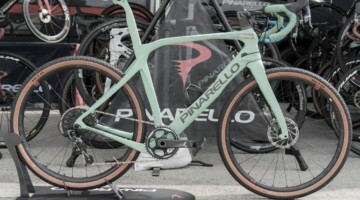 Regardless of Cannondale’s rating I’d like to see some pics of the bike with 40mm tires. David they don’t fit on the back as mentioned, but if we test it with a mismatched set we’ll be sure to snap a pic! Silly that that did not design it with Thru Axles! Seems like a perfect setup otherwise.. When they used to hand weld them in PA? I’ve always been a Cannondale guy. I LOVE CAAD! with that being said all the hype on this bike is crap! 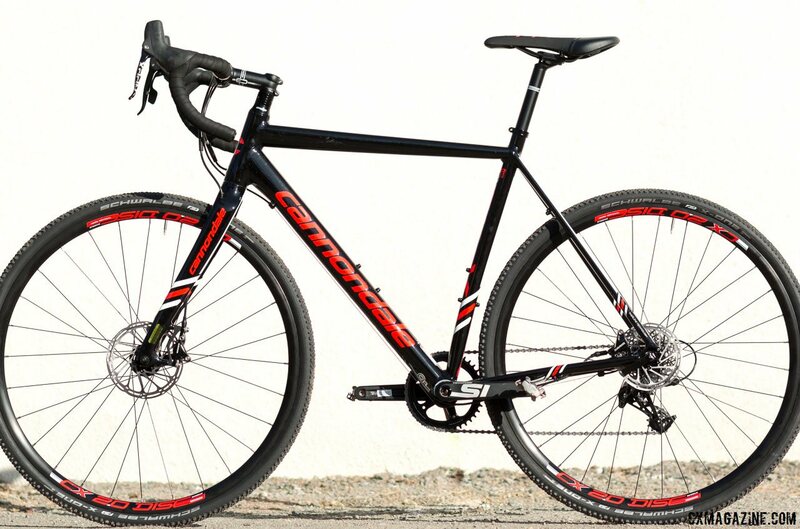 Oh an with the gravel grinding fad, fitting 40c is a must…. 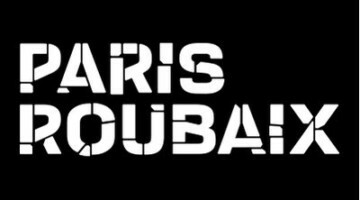 ‘subjective’ is a funny way to describe , Cannondale hiring a sales team at the last minute to make up for the Miss compared to what the rest of the industry is offering. I have one. It’s great to ride. Can i put knobby tires on my CAAD8? 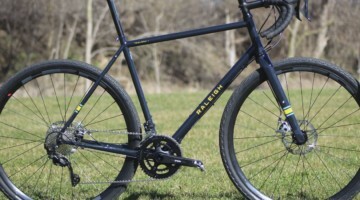 Did this review bike really weigh under 20lbs? It sounds like a lightweight wheel and tubeless tire setup would bring this bikes weight down to a very impressive figure for the price!